Bhindranwale always used to visit Bhai Gurjit Singh’s older brother Bhai Darshan Singh at his house because they were old friends. Sant Giani Jarnail Singh Ji Khalsa Bhindranwale and Bhai Darshan Singh once swapped their dastar’s with each other, they were ‘Paghwat Brothers’. The central forces surrounded them on all sides. Both the sides started firing and there was a fierce combat. The brave warriors of Khalsa panth fought to their last breath and last bullet. In this combat, Bhai Sukhwinder Singh Sangha, Bhai Baljit Singh Khela and Bhai Bikramjit Singh Narla attained Shaheedi (martyrdom). Under the command of Bhai Gurjit Singh Harihar Jhok, Sikh Student Federation was making a lot of Sikh youth aware of the injustice the government of India was serving to the Sikhs. Bhai Gurjit Singh was currently studying at Moga College in his final year of his BA. It was in these days Bhai Sahib joined the Sikh Student Federation and his honesty and love for Sikhi was spotted by Sant Jarnail Singh Ji Bhindranwale. Sant Giani Jarnail Singh Ji Khalsa Bhindranwale always used to visit Bhai Gurjit Singh’s older brother Bhai Darshan Singh at his house because they were old friends. Sant Giani Jarnail Singh Ji Khalsa Bhindranwale and Bhai Darshan Singh once swapped their dastar’s with each other, they were ‘Paghwat Brothers’. Sant Jarnail Singh Ji Bhindranwale asked Bhai Darshan Singh that they wanted something from him, after hearing this, Bhai Darshan Singh said to Sant Ji that he will give Sant Ji anything that they ask for. Sant Ji then said that they wanted his younger brother, Bhai Gurjit Singh. Bhai Darshan Singh really adored Bhai Gurjit Singh and they said that it would have been better if Sant Ji asked for something else but now they have asked for him, they will have to give him. Sant Ji made them into the spokesman of Sikh Student Federation. Sant Ji then got Bhai Gurjit Singh married to Bibi Rashpal Kaur who was Sant Ji’s niece, Bhai Veer Singh’s daughter who is Sant Ji’s younger brother. As the president of Sikh Student Federation of Ferozpur, Bhai Sahib beautifully bought all Sikh youth on to one platform and also punished many enemies of the Sikh panth. In 1979 Bhai Sahib left home as the Punjab police was continuously harassing the family. Bhai Sahib came to Sant Jarnail Singh Ji Bhindranwale and did sewa as a bodyguard of Sant Ji. When the Indian army tried invading Sri Harimandir Sahib in June 1984, Bhai Sahib was one of the fearless singhs who defended the Sikh throne. Sant Jarnail Singh Ji Bhindranwale and Bhai Amrik Singh told Bhai Sahib to leave and on 5th June 1984, Bhai Sahib left the complex exiting from the houses behind the Sri Akaal Takht Sahib. Bhai Sahib only managed to get couple of kilometres away from the Sri Harimandir Sahib when the Indian army arrested Bhai Sahib. Here one of the Dharmi police officers had seen Bhai Sahib with Sant Jarnail Singh Ji Bhindranwale and upon confirming this, the police officer put Bhai Sahib’s name of the innocent list. Bhai Sahib was sent to Amritsar jail and after 15 days Bhai Sahib was released. Soon as being released Bhai Sahib went to the neighbouring country, Pakistan where he received the militant training along with many more Singhs. As now the Sikhs would be fighting for freedom and not ask for equal rights. Bhai Sahib came back to Punjab from Pakistan and met up with his old friends, Bhai Manvir Singh Chaheru, Bhai Kuldip Singh Muchal, Bhai Aroor Singh and Baba Gurbachan Singh Manochahal. After this had happened, the Singhs made a Jathebandi called Khalistan Commando Force (KCF) which they made Bhai Manvir Singh Chaheru the General of. Bhai Sahib also started doing Parchar in colleges and universities and started the Sikh Student Federation Jathebandi again. Bhai Sahib punished many traitors of the Sikh panth like Tarlochan Riasti, Avinashi Singh, Dr Brar and also attacked many CRP branches in the Majha and Malwa area. The movement of Khalistan Commando Force and Sikh Student Federation became very strong. While Bhai Sahib was doing sewa for Sikh Student Federation, he also played a major role in doing actions with the singhs of Khalistan Commando Force. Sukhdev Ropar who was the convener of Sikh Student Federation had the first Jathedar of Khalistan Commando Force, Bhai Manvir Singh Chaheru arrested by the police. Now General Labh Singh alias Sukha Sipahi was made the Jathedar and the first action of Khalistan Commando Force was to punish Sukhdev Ropar for his cowardly act. Then General Labh Singh made Bhai Sahib the convener of Sikh student Federation. Soon Bhai Sahib was arrested by the police from the village of Jangpur, district Ludhiana. No torture of the police made Bhai Sahib give the police any information on fellow singhs. Now that Julio Francis Rebiero had the custody of Bhai Sahib, he didn’t solve the situation in Punjab. The police did not manage to keep Bhai Sahib for long. After offering the 2 police officers guarding Bhai Sahib, 80,000 rupees Bhai Sahib managed to escape with the help of the two police officers and once again went to Pakistan. When Bhai Sahib returned, Bhai Daljit Singh Bittu requested Bhai Sahib to take the lead of Sikh Student Federation but Bhai Sahib said no to the request and said, “My time to be martyr is near, you continue the roll of leading Sikh Student Federation as me leading the federation or you leading it is the same thing.” Bhai Sahib had also teamed up with Bhai Gurdeep Singh Deepa Heranwala to punish, Sarvan Cheema in Nakodar’s Varinder Gagan. Bhai Sahib continued to punish the enemies of the Sikh panth in the Malwa area. Bhai Sahib was arrested and blindly tortured by the police. The police did not want to repeat the same mistake as last time by keeping Bhai Sahib in custody for too long. 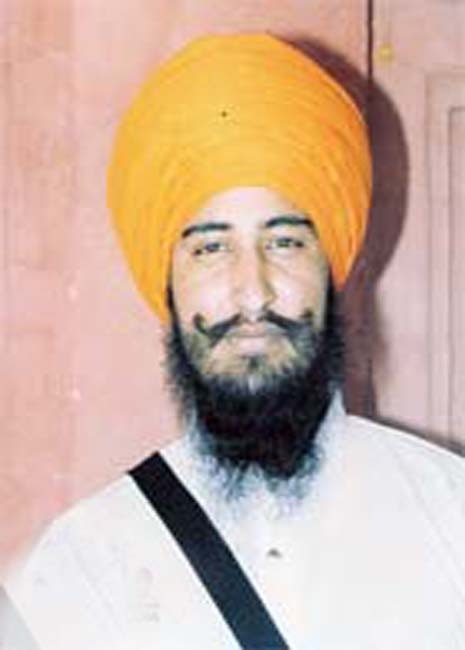 On 2nd November 1991, the Punjab police killed Bhai Sahib in a fake encounter near Ludhiana. In the morning the day after around about 7.45am, The Punjab Police did Bhai Sahib’s cremation at Moga Guest House and then released a statement to the public that Bhai Gurjit Singh has got Shaheed. Bhai Sahib’s shaheedi was and is a great loss to the Sikh Nation. Pics & Videos :- Beadbi of Guru Granth Sahib Ji at Village Malke, District Moga, Punjab.